Finally! A movie that is able to convert a gritty subject and violent screenplay into an intense, brutal and poetic thriller. Drive is movie making as the art form it is supposed to be. Every scene is honest in it's storytelling as it is dreamy in it's execution. A sheer cloak of fantasy helping soften the blows of scenes that would otherwise rival Casino in their fetish for testing the boundaries of the human form to take punishment. 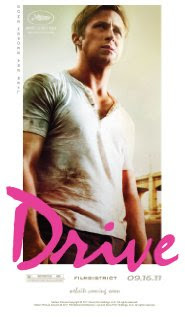 The Driver (Ryan Gosling) is the unnamed protagonist of the movie, who excels at cold-as-steel getaway driving. The movie begins with the Driver manning a souped up Chevy Impala, waiting outside a building where two masked robbers are committing a crime. What follows is a display of calculated urban run-away driving that is probably one of the best I have seen. It is not the high-speed variety like, say, the car chase in Ronin, but it is an equally heart-pounding cat and mouse variety - in the streets of downtown LA. The Driver seems to have everything going for him, a part-time role as a movie stunt driver, a car mechanic and an emerging opportunity as a stock car racer. As luck would have it in these cases, he meets someone. A neighbor and her young kid, with whom he develops a genuine chemistry - softening an otherwise stark and empty life. When her husband unexpectedly returns from prison and is caught up with debts from his past, the Driver decides to help. The second part of the movie is dedicated to the realization that in his desire to help, he had signed up for something that was deeper and more sinister than it had seemed. As he begins to peel the onion of the conspiracy, the Driver realizes that he may have to sacrifice everything to see the sequence of events through to their logical completion. The scenes of Drive flow together beautifully. There is nothing static about any of them. Either the camera or the subject is always in motion, a sort of underlying sense of flow through the entire movie. In contrast dialogue is deliberately awkward, scenes wantonly go a tad too long. The resulting sense of discomfort makes every scene magnetic. Don't be surprised if you find yourself holding your breath after each sequence, or if you come out of the movie exhausted. There aren't that many violent movies that can make a claim to be realistic yet fantastic at the same time. Drive comes close. There is just enough style between the violence on screen and the audience to take the edge off. But not so much that the message is lost. Even if you are squeamish about graphic movies, this might be the one you might want to take a chance on. And if you do not like it, you could just - Drive.